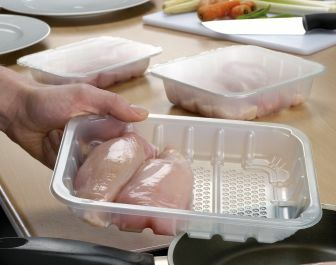 UK-based LINPAC Packaging has teamed up with additives supplier Addmaster to develop a range of trays and films with built-in antimicrobial technology to reduce bacteria growth on the outer packaging of fresh meat. Contamination from harmful bacteria such as Salmonella, E.coli and in particular Campylobacter, is a common cause of food poisoning in the UK. As said, the Biomaster antimicrobial technology from Addmaster is a silver-based additive that can be added into any plastic, paper, textile, painted or coating product and reduce the growth of Campylobacter on their surface by up to 99.99%.